For the village near Darlington, see Coatham Mundeville. 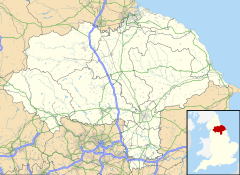 Coatham is a place in the borough of Redcar and Cleveland and the ceremonial county of North Yorkshire, England and is now a district of Redcar. Coatham began as a market village in the 14th century to the smaller adjacent fishing port of Redcar but as their populations grew from the 1850s, the dividing space narrowed. Though Coatham is now only a mile-wide district in the town of Redcar, the need for definition was strong enough to warrant the western boundary being marked by a fence which ran the length of West Dyke Road and West Terrace. Coatham comprises the remaining coastal land north of the railway line from West Dyke Road to Warrenby in the west. Between 1875 and 1898, Coatham had a leisure pier. It was intended to extend 2,000 feet (610 m) into the sea, but damage in the building stage from shipping and storms curtailed the distance to 1,800 feet (550 m). In October 1898, the pier was struck by the 757 tonnes (834 tons) Finnish freighter Birger. The ship had developed trouble during a storm in the North Sea and despite passing Grimsby, Scarborough and Whitby, she carried for South Shields. During a ferocious storm she crashed onto the rocks at Coatham and wrecked a 60 feet (18 m) section of the pier in the middle. Only two members of her crew of 15 were rescued; the pier collapsed a year later. The present-day Redcar & Cleveland College was a grammar school before 1975. The majority of modern Coatham is Victorian housing, most notably at its northern tip by the Coatham Hotel built in 1860. A small boating lake, leisure centre, arcade complex and caravan park now occupies the remainder of Coatham's coast. To the east, the Tees Valley Wildlife Trust's Coatham Marsh Nature Reserve hosts 54 hectares (130 acres) of ancient Marsh and grassland. Since the mid-1990s political debate has been generated amongst Coatham's five thousand residents as to the future of the last undeveloped section of Coatham's coastal land known as Coatham Common/Coatham Enclosure - for the last 25 years used as a golf course and local recreation area. Residents are objecting at losing open space to the council's proposed housing and leisure development planned to revive the tourist industry. The Supreme Court of the United Kingdom announced on 3 March 2010 that Redcar Council must register the land as a Village Green. Coatham is the town where Jane Gardam, twice winner of the Whitbread Prize, was brought up and where some of her novels are set. ^ UK Census (2011). "Local Area Report – Coatham Ward (as of 2011) (1237321162)". Nomis. Office for National Statistics. Retrieved 21 October 2018. ^ Historic England. "Coatham Pier (1463355)". PastScape. Retrieved 21 October 2018. ^ Lloyd, Chris (19 October 2018). "End of the pier story". Darlington & Stockton Times (42–2016). p. 37. ISSN 2516-5348. ^ "Coatham Marsh - Tees Valley Wildlife Trust". Tees Valley Wildlife Trust. Retrieved 21 October 2018. ^ Gray, Louise (4 March 2010). "High Court rules ramblers have right of way". The Telegraph. Retrieved 2 August 2016. ^ Stade, George; Karbiener, Karen (2009). Encyclopedia of British writers, 1800 to the present (2 ed.). New York: Facts On File. p. 199. ISBN 978-0-8160-7385-6. Wikimedia Commons has media related to Coatham.